Time to prepare yourself for a little weirdness because Czech director David Jařab's Head – Heart – Hands (Hlava - ruce - srdce) is far from your typical drama. Set in Austria-Hungary during WWI, it tells of Colonel von Haukwitz who dies under strange circumstances during a séance. 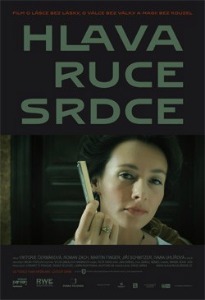 When his fiancée discovers that the Colonel's head, hands and heart were removed from his body after his death she sets off to find out what led to the dismemberment while a military investigator by the name of Vrana conducts his own investigation which uncovers that other parts of the body (not clear if this is the Colonel's body or other bodies in general) are being exploited by occultists. Let's recap: grizzly removal of body parts, the occult, WWI Europe, a story written and directed by a man best known for his surrealist work in theatre… definitely has the makings of an odd mystery. I really like this trailer which features a sparse voice over and some haunting images, particularly the preserved head.